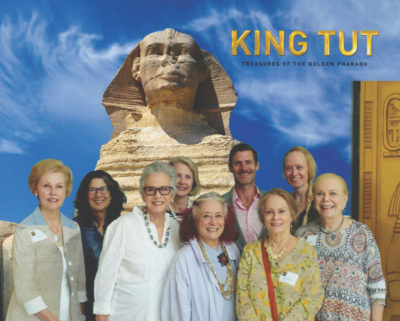 VISITING THE TUT EXHIBIT as guests of California Science center trustee Margo O’Connell are, left to right: Gayle Wilson, Diane Perlov, O’Connell, Sherry Tunnell, Joan Quinn, M-K O’Connell, Michelle Conrad, M-K’s wife Catherine Dupree and Linda Pura. Boys & Girls Clubs of America honored club members and club alumni at its annual Youth of the Year Gala July 12 at the Beverly Hilton Hotel. Boys & Girls Clubs alumnus and actor Anthony Anderson emceed the event, which featured a special performance by Aliyah Moulden, “The Voice” Season 12 finalist, who also is a club alumna. Andrew Tennenbaum, president of Flashpoint Entertainment, and Dean A. Spanos, controlling owner and chairman of the board of the Los Angeles Chargers, co-chaired the 28th annual event. SINGER ALIYA MOULDEN and actor Anthony Anderson, at left, are both Boys & Girls Clubs alumni. Joining them in celebrating at the Youth of the Year Gala is the event’s co-chair Andrew Tennenbaum. Anthony Anderson’s words of welcome included memories of his own experience of growing up in the club. In addition, nine 2018 nominees for the Pacific Youth of the Year Award shared their experiences relating to the academic success, good character, citizenship, and healthy lifestyles that resulted from their participations in the club. Elissa Margolis, senior vice president of Enterprise Social Responsibility at The Walt Disney Company, announced this year’s winner, 16-year-old Jeniya McCullar, who, having overcome a difficult childhood, will receive a $10,000 college scholarship renewable for up to four years. Next, he will go to Washington, D.C. to contend for the national Youth of the Year title that comes with an additional $100,000 grant for higher education. Also at the Beverly Hilton, among the 600-plus supporters, were Carrie Schwab-Pomerantz, board chairman of the Charles Schwab Foundation, Fox Sports sponsors Judy and Jeff Henley and Boys and Girls Clubs of America president and CEO Jim Clark. The heat of August began with an exciting gathering hosted by Hancock Park’s Margo O’Connell. Her guests were treated to a private tour of “King Tut: Treasures of the Golden Pharaoh” at the California Science Center. Diane Perlov, senior vice president of exhibits, provided a revealing overview of the exhibit and how it came to be. Forty percent of the items on display have never been outside of Egypt and are actual artifacts from the tomb itself. The tour was followed by lunch and a discussion in the Sussman Trustee Room. There for a dazzling experience were Margo’s son M-K and daughter-in law Catherine Dupree, Joan Quinn, Muses (auxiliary for the California Science Center) President Sherry Tunnell, former First Lady of California Gayle Wilson, Michelle Conrad and Linda Pura. Get to the Science Center soon! The exhibit is open only until Jan. 6, 2019. KAREEM ABDUL JABBAR speaks to guests at the Hancock park home of Dr. Maskit Maymon and Dr. Gary Schiller. A warm mid-August afternoon in a lovely Hancock Park garden greeted supporters of the American Society of Hematology. (Hematologists focus on the care of patients with disorders of the blood, bone marrow and lymphatic systems.) 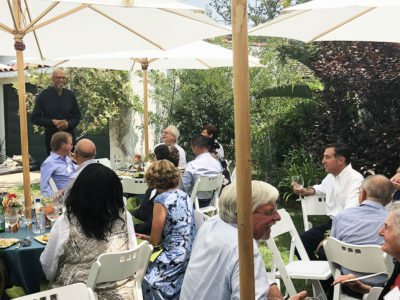 The guests assembled at the McCadden Place home of Dr. Maskit Maymon and Dr. Gary Schiller heard an interesting talk by basketball legend Kareem Abdul Jabbar.